Last night I was checking out the results from the prologue stage. The Donunt King R35 GT-R is competing in the modern competition class. 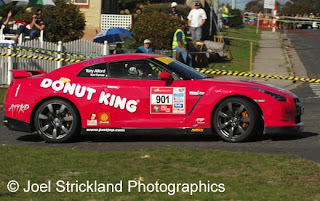 One of about ten Nissan GT-R's in the Targa this year. There are more Nissan Skyline GT-R N1's listed than probably raced together at times. Setting the pace was a Porsche Turbo that did the Prologue stage in 3:12 followed two seconds later by a Lamborghini Gallardo Superleggra , and four seconds later by a Porsche GT2. 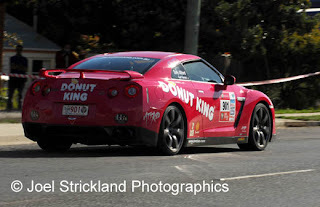 The Donut King R35 GT-R came in 14th place with a 3:22.